Since we are still in catch-up mode and these posts lie between when I started this hobby and when I decided to blog about it, I’ll fast forward a month to my first night out with my gear again. With a month of reading and reflecting on what went wrong the last time, I was off to a bit of a better start. It also helps to be around someone that knows what they are doing… more on this later. It was May 3rd and I was in Huntsville, TX at the Sam Houston State University Observatory that just so happens to also be the designated dark site for the Huntsville Amateur Astronomy Society (HAAS). My very first AP image of the night was Messier 81 (NGC 3031) – Bode’s Galaxy. Bode’s Galaxy is a spiral galaxy about 12 million light-years away in the constellation Ursa Major. M81 is pictured on the left here and on the right, you’ll see Messier 82 (NGC 3034) or the Cigar Galaxy. 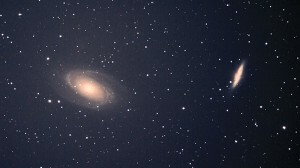 M81 and M82 have this weird gravitational tidal force going on that has significantly increased star production. This image has gone down in history as my first successfully imaged target. Everyone remembers their first. I stacked all the frames in that same free program, Deep Sky Stacker, and then stretched them in Adobe Photoshop CC. Another target (there were three in total) this Y-chromosome-debutante evening was M51. I wanted it to be M31, the great Andromeda galaxy, but she was gone for the season. 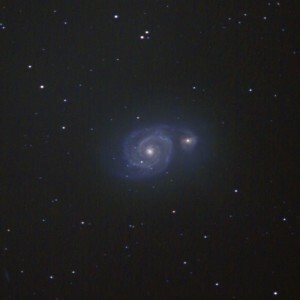 So Messier 51 (or NGC5194), The Whirlpool Galaxy, was my gal. 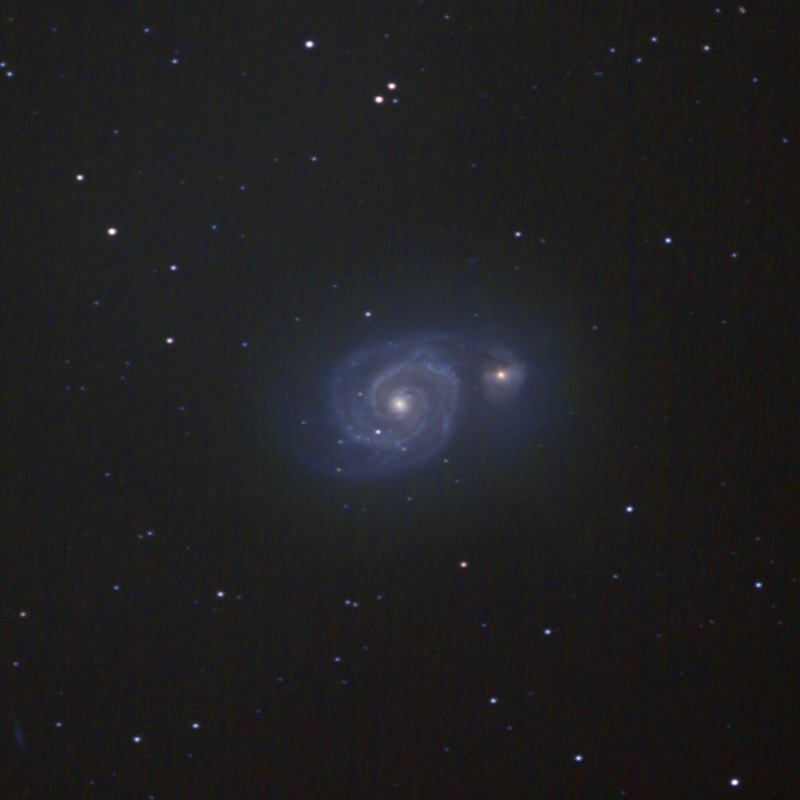 The Whirlpool Galaxy is alive in Canes Venatici (hunting dogs)… a small constellation near Ursa Major (larger bear). Ursa Major is more commonly known by part of it’s composition – what we all grew up calling “The Big Dipper” is actually the tail of this big bear constellation. 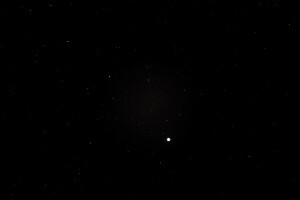 Anyhoo, so Canes Venatici is a neighboring constellation that is the home to this little gem. If you follow the “handle” of the Big Dipper to the star on the end (Alkaid) and then look slightly south (as in, away from polar north relative to Alkaid), you will find Messier 51. M51 was discovered by Charles Messier on October 13, 1773. It was originally thought to be about 37 million light years away and up until just within the last few years when we observed light from two different supernovas within the galaxy that provided more accurate measurements placing it about 25 million light years away. A smaller dwarf galaxy, NGC5195, collided with the larger galaxy we refer to as the Whirlpool Galaxy, NGC5194, and gravitationally ripped some of the material making up NGC5194 off as it passed. This smaller galaxy is what you can clearly see at the outermost tip of one of NGC5194’s arms. These photons that have been travelling 1.36146056 × 10^20 miles to say hi! 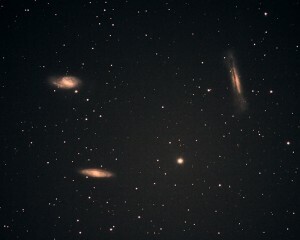 I also managed to image M65 and the Leo Triplet. The Leo Triplet, also known as the M66 group, is about 35 million light years away, so the farthest of anything I shot last night. It consists of M65, M66, and NGC3638. It is conveniently named due to it being in the constellation Leo. This is a very cool target that deserves a revisit after the truck out of the ditch taking out mailboxes. Astrophotography, in general, is an exercise in patience. It is also deceptively expensive depending on your expectations. It would seem that the more I learn, the less I know. Ironically, there is a life lesson there that can be applied to so, so many things. It took me some time to piece this together. In fact, at every turn and just when I thought I was done ordering parts, I found something I had forgotten or something I miscalculated. I started before the new year in wrestling the tendrils of intellectual thread needed to take the required steps to get started and here it is nearing spring with little progress. Eventually, the UPS man and I high-fived on my porch enough times to bolt this rig together. This goal of this Frankenstein setup was to leverage the existing (substantial) investment in my wildlife photography gear for capturing stars… in the wild. Last year, I finally upgraded my tried and true Canon 1Ds Mark II after 8 faithful years in the field and around the world to the current Canon 1Dx body. I own a Canon 600mm f/4L IS lens (not the II-series) that is an amazing work of art in optical craftsmanship. The custom machined side-by-side saddle from ADM allowed me to mount the 600mm camera lens in one saddle and the ShortTube 80 in the other saddle (parallel) for imaging and auto-guiding respectively. 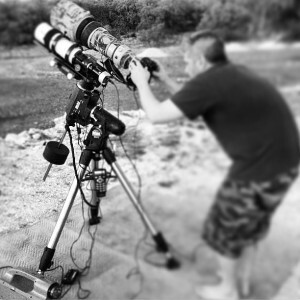 My dad lives far from the flavor of light pollution I deal with at home, so naturally a test of all this gear at his place on a new moon seemed like the perfect christening. It was a gorgeous night. Sirius was twinkling with more color than a police squad car’s light rack and the only way this launch could have been better is if I shattered a bottle of Veuve Clicquot Ponsardin over the right ascension axis of my mount. Alas, it was not to be this night. I spent hours trying to get the mount aligned and went to bed defeated without a single shutter release. I did enjoy the darkness and saw some green fireballs courtesy of the Lyrids shower in progress. In hindsight, I can say that had I known how to change the slew speed on my mount (on the hand controller), I would have been able to finish the star alignment. That is just how new I was/am to all this… even the table stakes are challenging exercises. The rabbit hole is quite deep from here. So my wanderlust for stardust has officially begun. I can remember wanting to photograph the night sky as far back as my early twenties. 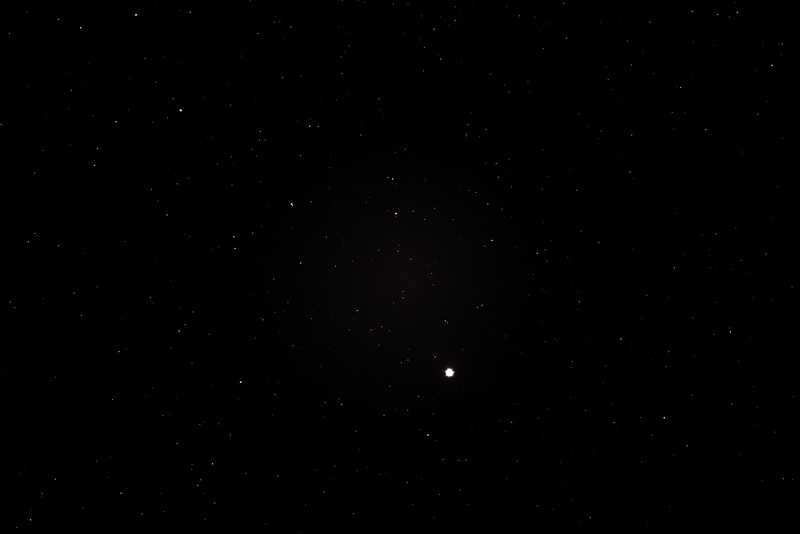 I think I moved from one excuse to another over the years, which is completely against the nature of the man I’ve become, but settled on a favorite: something, something, light pollution. Living in the nation’s fourth largest metropolitan area by population and arguably the largest by geography can only mean one thing… a lot of humans with a lot of lights turned on. The constant onslaught against the night rages from street lights, porch lights, never-ending construction, and citizens that never sleep. I suppose I simply figured that it wasn’t to be until I had retired into the serene countryside where the only terrestrial lights were from the flicker of fireflies across the field. It was a friend of mine expressing interest in learning to photograph the Milky Way over scenic night landscapes that made me reevaluate my position. As a long time photography enthusiast, my desire to help him learn and accomplish his goal gave me enough knowledge of this largely misunderstood hobby to set aside my own reservations and start. I spent some time learning the barrier of entry requirements and did an enormous amount of research online to determine the best way to dip my toe in the water just enough to clarify my direction. My personality lends my behavior more toward all-in when it comes to doing. Dabbling never really set well with me. I believe in life and love, we should grab the goblet with both hands and drink deep. If some spills from the edges of our mouth and down our chest, such is living. No one truly lives suckling experiences from a sippy cup. I digress. Behold! This is my very first “official” astrophotograph. There will be more, but this is the first.